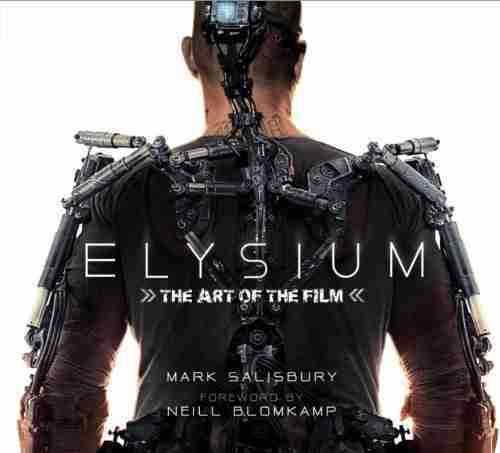 Neill Blomkamp’s Elysium is a visually stylish science fiction blockbuster, so it is no surprise that it would have a visually impressive tie-in book detailing the making of the film. Blomkamp’s follow-up to District 9 is set in a futuristic Los Angeles. The film sees Matt Damon’s Max attempt to infiltrate the titular safe haven, run by the evil Delacourt (Jodie Foster). Like his directorial debut, Elysium has a distinct look, a real-world aesthetic which gives the future a handmade quality. In a way, Blomkamp’s style is modern steampunk, a nuts and bolts design, rough around the edges. Visually, Elysium is similar to his South African-set sci-fi film, but it it also shares the same subtext. It’s as much about how humanity interacts with itself, as it is about humanity interacting with technology. Author Mark Salisbury is no stranger to behind the scenes books, and his writing style is clean and informative. Salisbury guides the reader deep into the film’s production, with the book being divided into two sections – Earth and Elysium. These two halves show how Blomkamp and his crew created a rundown future, while also showing the sheen and clean lines of Elysium. Blomkamp introduces the book, wearing his fanboy credentials on his sleeve. He then turns things over to his team, who show in great detail how they designed and built the film’s world. It’s good to see a lot of practical effects work, rather than easier CGI option (not that the film doesn’t contain computer effects). There’s much to admire in Elysium: The Art of the Film, a book that will be a marvel for fans of Elysium and the future worlds that Neill Blomkamp creates on screen.